The southernmost island of the Golden Isles, Jekyll Island is one of the most popular islands for those who visit coastal Georgia. This 5,500-acre island is home to 10 miles of shoreline and a variety of events, family-friendly activities and attractions. From the iconic Driftwood Beach to the island&apos;s historical homes, the Georgia Sea Turtle Center and more, Jekyll Island has something for everyone. Planning a trip? Read on below for more information about Jekyll Island&apos;s rich history and the variety of things to do and see. 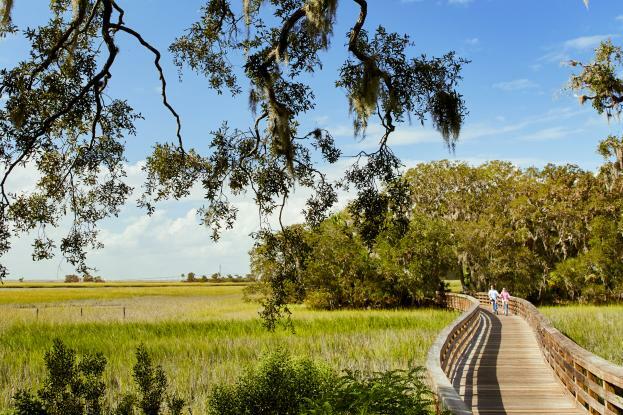 Plus, you can find out more about Jekyll Island weather before you plan your next escape—the island is particularly pleasant in spring and fall! Jekyll Island&apos;s history begins some 3,500 years ago. Prior to British colonization, the islands first inhabitants were Native Americans. General James Oglethorpe founded the colony of Georgia in 1733, and along with it, Jekyll Island. The island was named for Sir Joseph Jekyll, a financial supporter of the colony. Major William Horton was appointed by General Oglethorpe to build an outpost on Jekyll Island to protect Fort Frederica on St. Simons Island. The island was home to prosperous plantations until the end of the Civil War. Jekyll Island was purchased in 1886 by a group of wealthy families as a private retreat. By 1900, The Jekyll Island Club membership included the Rockefellers, Morgans, Cranes and Goulds and represented over one-sixth of the world’s wealth. The Club closed in 1942 and Jekyll Island was purchased by the State of Georgia in 1947. Learn more about the rich history of Jekyll Island, Georgia. Or, revisit the past with a tram tour of the National Historic Landmark District, including many of the opulent mansions their millionaire owners called “cottages." Jekyll Island offers an abundance of recreational activities that are sure to please visitors of all ages. Enjoy ten miles of white sand beaches, 63 holes of golf, an outdoor tennis complex, the Summer Waves Water park, a fishing pier, Jekyll Island dolphin tours, horseback riding tours, nature centers, 20 miles of bike trails and the Georgia Sea Turtle Center. In addition, since the island is owned by the State of Georgia and managed by the Jekyll Island Authority, the island’s development is limited to just 1,609 acres to preserve the critical barrier island ecosystem. Great lengths have been taken to honor this ratio while the highly anticipated revitalization of Jekyll Island moves forward. Since most of the island is protected, there is also plenty of nature and wildlife to explore! All the family-friendly activities on Jekyll Island are enough to keep any visitor busy! Too much to choose from? Try one of the island&apos;s guided tours, build your trip from a suggested itinerary to help you decide where to start on this unique island, or check out our five favorite things to do on Jekyll Island. There is so much to do and see throughout the year in Jekyll Island. Enjoy signature events in Jekyll Island every year like the Turtle Crawl, which benefits the Georgia Sea Turtle Center, and the Jekyll Island Shrimp & Grits Festival, a favorite among foodies! Whether you&apos;re looking to get a taste of the local culture, enjoy the beautiful Jekyll Island beaches and landscape or celebrate the holidays with loved ones, there are plenty of Jekyll Island events to enjoy. Find fresh seafood, area favorites and more throughout Jekyll Island. From sit-down fare to quick southern favorites, you won&apos;t be at a loss for dining options on Jekyll Island. Enjoy water views at Beach House or The Wharf, local flavors at Jekyll Island Seafood Company, or a grab-and-go treat to start your day at The Pantry. Check out more of the best restaurants on Jekyll Island. Accommodations are invitingly varied and include a grand historic hotel, oceanfront hotels and even beach side camping at the Jekyll Island Campground. Find lodging on Jekyll Island and be sure to check the current specials and packages on Jekyll Island! Jekyll Island offers diverse shopping, from upscale boutiques to souvenir shops and more. Find some of the best shopping on Jekyll Island. View a map of Jekyll Island to help orient yourself before your trip!